QR codes on cardboard? That’s one way to raise money for a UK homeless charity. 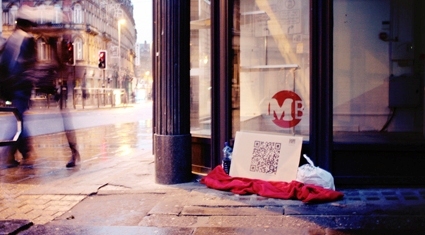 Leeds-based creative agency Propaganda helped homeless charity Simon on the Streets this Christmas, launching a very interesting QR code campaign to help raise funds for those sleeping rough on the streets of Yorkshire in the UK. Rather than sending Christmas gifts to its clients, the agency laid out QR codes printed on cardboard and positioned them amongst blankets and belongings, to replicate the outdoor dwellings of homeless people. The installations were situated around Leeds city centre, and once scanned by a smartphone or tablet QR code reader, the user was taken to a JustGiving page to donate money directly to the charity. Whilst Propaganda donated £1,000 to the charity itself, you can also still donate yourself here.